In the fall of 2004, my good friend Paul Sierra mentioned that his dealer, Oskar Friedl, was working with the Zhou Brothers on an artist space project in Bridgeport and that they might have an office space available for my Art Advisory business. When I met Oskar at the Zhou B Art Center, the building was mostly empty except for Oskar’s gallery and Martin Bernstein’s and Nick Depeder’s studio spaces, all located on the third floor. The space Oskar presented to me was at the end of the hall behind the oversized freight elevator. It was much larger than what I needed for an office, but I could feel the potential for the space. Eventually, I decided to create a commercial gallery in the front of the space and put my office in the back. Shortly after my meeting with Oskar, Sergio Gomez and I spoke on the phone about another project and his Masters of Fine Arts program. It was then that he mentioned he was looking for a studio. I knew just the place. I gave Sergio a number to call, and so began the birth of CRN Fine Art and 33 Collective on the third floor of the ZBAC. Old friends and new fast friends, the tenants at ZBAC quickly formed an alliance in an attempt to create a splash on the Chicago art scene by making our galleries an art destination and the building an artists’ mecca. The first official ZBAC Third Friday event was planned for late in the fall of 2014. We all worked feverishly to pull our respective spaces together and to get our collective audiences to come out to the center. Space heaters and replacement fuses notwithstanding, we put together the first five exhibitions that would eventually become larger than any of our individual previous shows. 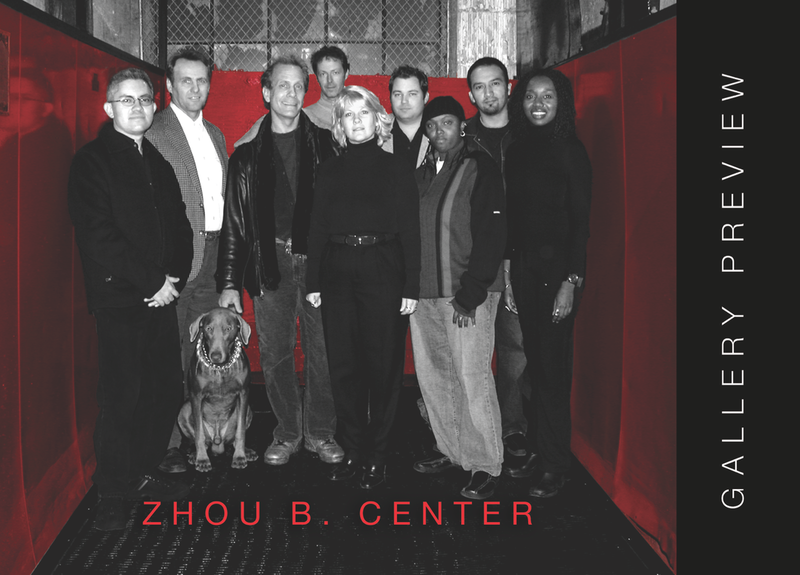 The ZBAC Grand Opening invitation was a photo, shot in the freight elevator, of all of the tenants. The building was especially cold the day the photo was shot. We all had to strip off our coats, drop them on the floor outside the elevator, then run into the elevator and snap the photo. The grand opening was more successful than imagined, with a large group in attendance despite the cold wet evening. The decision to brand “Third Fridays” the signature opening night for ZBAC was then born. During my time at the center, we continued organizing exhibitions and having openings, new artists moved into the space, and we all promoted as a group since there was clearly more power in numbers. The third floor was the hub for the building and alive with artists and enthusiasts. However, the rest of the building remained eerily empty for the next year. In the spring of 2005, I was working with Michael Workman, founder of Bridge Magazine and the Bridge Art Fair, who was trying to get funding for the upstart of his magazine. Remembering my conversation with Oskar the summer before, I thought that the ZBAC might be a good fit both as a space for a fundraiser and as an opportunity for the center to boast its cool vibe to the upper echelon of the Chicago art community. The Zhou Brothers had already established themselves as players in the art arena and had hosted events in their foundation building a block away, but using the ZBAC for events was new and exciting. The Zhou Brothers were more than happy to pull together the resources to get the building ready for the party. The Bridge Magazine fundraiser was the first of many non-profit art events hosted at the art center. Circumstances in my life pulled me away from the art center by 2006. I remained in touch with the artists throughout the years. Artists came and went, as did galleries. The Zhou Brothers continued growing the art center, added the café, brought in Michael Zhou, and built out dozens of studios and galleries. Ten years later, my good friend Sergio Gomez has remained as one of only two of the original resident artists in the ZBAC. The fabulous Martin Bernstein is the other original artist still in the game. Sergio Gomez has been charged with many tasks throughout his mostly volunteered tenure at the art center. He has been working diligently behind the scenes to keep Third Fridays going, mentoring artists, giving exhibition opportunities to young artists, and curating outstanding exhibitions for a decade. Over the years, I have referred to him as the Impresario of the Zhou B Art Center. He has also been called the JLO of the Chicago Art World, because he can do it all, just like JLO. He is also known as the Kevin Bacon, because there are less than six degrees of separation between Sergio and anyone else in the art world. I set out to write an essay about the art center, but it isn’t possible to talk about ten years of art at the ZBAC without acknowledging the contributions of Sergio Gomez. His name is synonymous with Zhou B Art Center. I congratulate the Zhou Brothers and all of the artists and gallerists at the art center on the ten year anniversary. I feel honored to have been part of this wonderful art movement in Chicago. If nothing more, I hope that it shows what a small group of friends with big ideas, collaborations, hard work, and persistence can do when working together for a common cause. I would like to thank the Zhou Brothers for all of the support they have offered the art community and Chicago with the creation and continued support of the ZBAC. I look forward to the next fifty years.